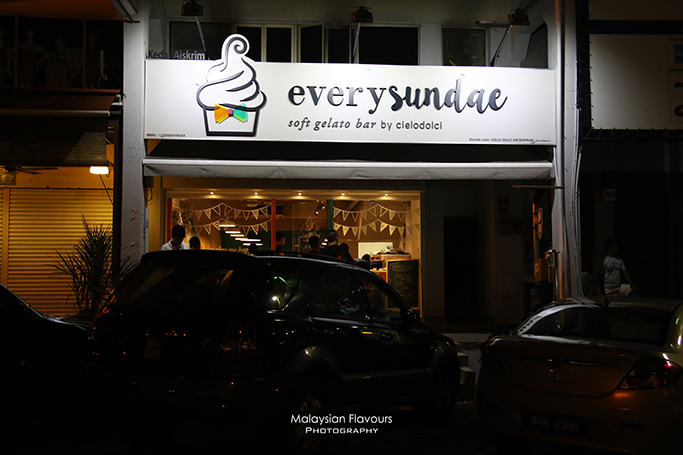 Every Sundae at Damansara Uptown, another soft gelato dessert bar by Cielo Dolci which receives high attention from ice cream lovers after Softsrve, the ice cream cafe that hits the town about 3 months ago. 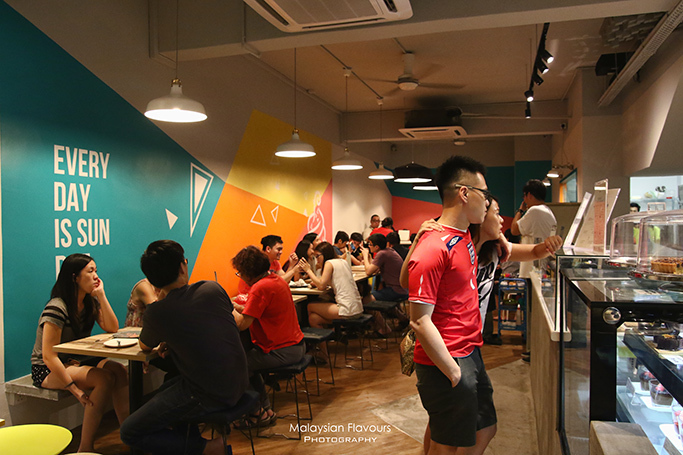 Located beside Village Park Nasi Lemak, our favourite location for one of the best nasi lemak in town, the opening of Every Sundae is definitely a great news to us. Now we can devour into a plate of aromatic nasi lemak with ayam goreng and enjoy a scoop of ice cream from the next door after that. Sinful but delicious meal huh? Many knows that Cielo Dolci is the expert in Italian Gelato. They started humbly in Paradigm Mall. 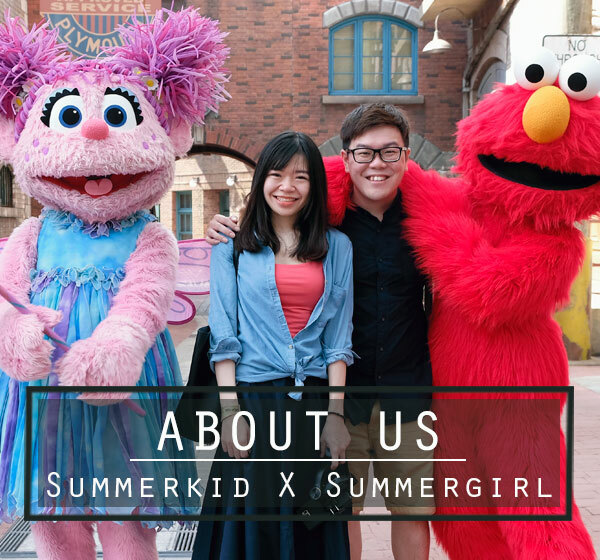 When Whimsical in Publika opened, we started to see their performance. 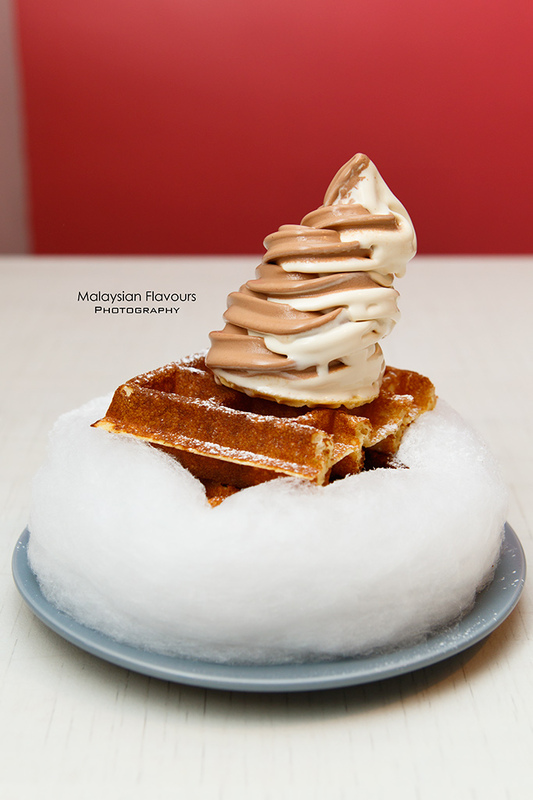 By now, the opening of Every Sundae Damansara Uptown has proved to be another successful milestones for Cielo Dolci. Clap Hands. A little differ from their counterpart, soft gelato takes the limelight in Every Sundae instead of gelato. However, you can still dig into their popular Italian gelato stored in Pozzetti tube, which occupies a small space near to the entrance. Coffee (latte, flat white, cappuccino, long black, etc. ), tea (Charmomile, Earl Grey, Peppermint, Lemongrass & Ginger, etc.) , chocolate, affogato are available in this cafe too. 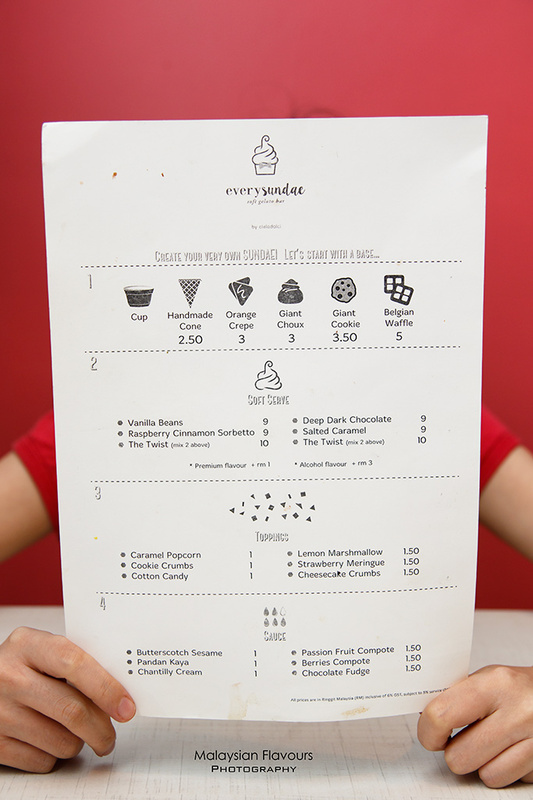 Besides the promising soft gelato, what makes Every Sundae special is their “customize your own soft gelato”, where you can build your own flavours and toppings from a varieties of biscuits, waffles, toppings, gelato flavours. Seems like “mix and match your own food” is picking up the food trend in KL-PJ, from The Counter Pavilion KL that gives thousands of possibilities in stacking your own burger to Okonomi Publika that allows you to decide your sushi combination. 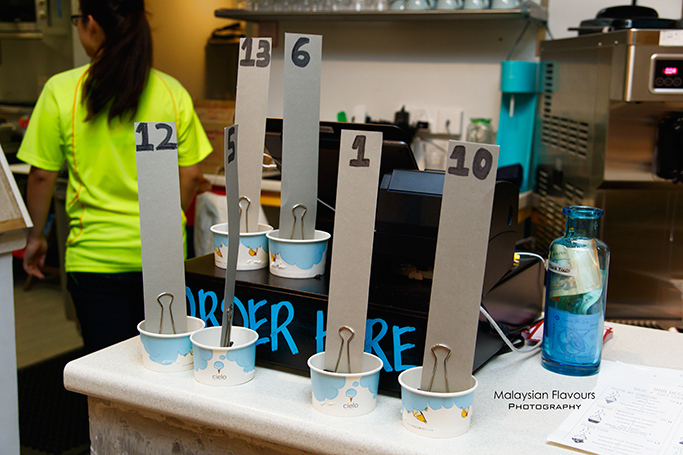 A general combinations (*opt one from each step) will result in softserve that costs around RM16. 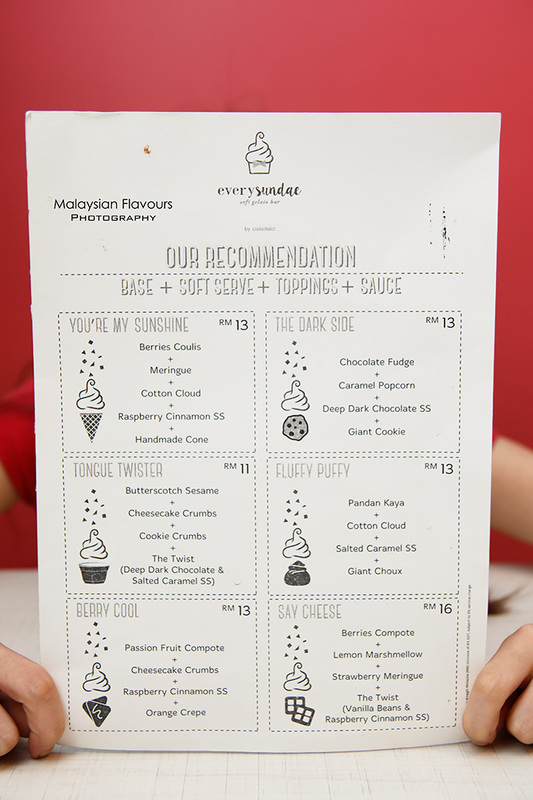 In case you have a hard time deciding, go quick by picking Every Sundae combination, priced from RM13 to RM16. 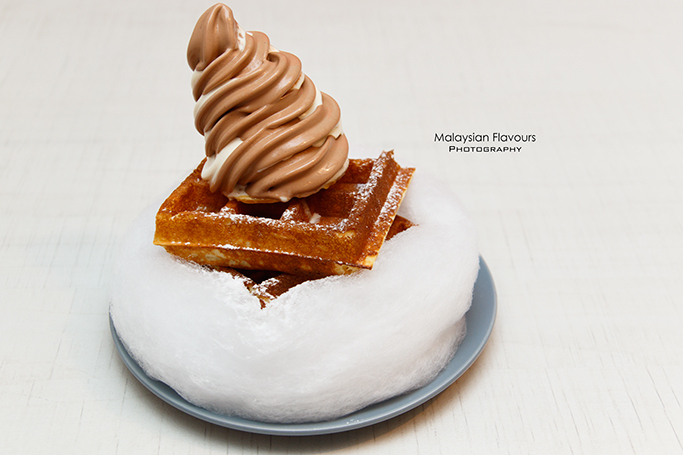 Our choice of Belgian Waffle + The Twist (Deep Dark Chocolate with Salted Caramel softserve) + cotton candy came to RM16. Yeah, so cute! Our soft gelato is sitting on a bed of “cloud”! Cotton candy is a must in Every Sundae softserve creation. You can hardly go wrong with this old-school sweet treat that create dreamy, cloud-like presentation. We saw it goes more attractive with cone! Too bad we had to skip that as there’s just two of us. Every Sundae softserve is extra smooth, creamy, melt-in-mouth with medium milkiness (*at least not as rich as the one we had back in Softsrve). No regret with the choice of The Twist, because we get to taste two flavours at one time by adding only extra RM1 compare to individual flavours. Waffle is crispy outside, fluffy soft inside but not compact, chewy nor spongy. We love the slightly burnt edge that contributes a faint hint of bitterness that helps to balance up the sweetness from soft gelato. Not really bother to eat cotton candy, since it is so sweet but surprisingly, it goes well with Every Sundae melted softserve. A bit sticky sweet, caramelized-like with chocolaty pleasure. Comments: We like this cheerful cafe. The design itself is lively, charming with bright colours for walls and furnishing, coming to a match with their playful, gimmicky softserve. Service is good, friendly. Expects lots of smiles and colours here.